Two and a half years of running, starting with my longest distance being 30 seconds. Two years of swimming, starting from a gasping, flailing, terrified 25 yards. Ten weeks of cycling after a break of two years (and the loss of confidence after a scary fall). Eight months of strength training, little by little, building basic balance, week in and out. And one year of accepting my body, just as it is, as my home. That's what brought me to this morning. 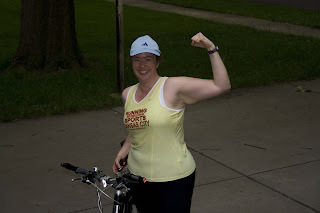 This morning, I did a sprint-distance brick workout: I biked ten miles, then ran three. That's what I'll be doing in a few weeks in Smithville, at the first triathlon. I don't have to worry anymore not knowing whether it's physically possible. I've done the thing I didn't know that I could do. I feel like I've already crossed the finish line. Don't I look happy? 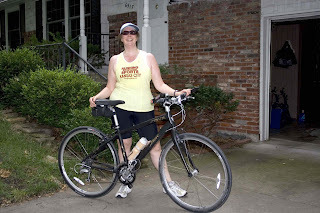 Here's what an unlikely triathlete looks like finishing her first full-length brick. Here is what her stopwatch looks like after the brick when she realizes that she's broken 11-minute miles for the first time. Here she can't stop smiling. And here's what she's thinking: I didn't just walk out of my house today and do my first brick. Everything I've had to overcome, every negative thought I've had to banish, stands behind this. Every step of every jiggling, huffing half mile, every hard-fought uphill run, stands behind this. Every 3-pound curl rep when women around me were doing one-armed pushups stands behind this. I have loved those moments, too. At every step, doing what I could felt better than any day when I told myself I couldn't. When I started seeing my body as my partner instead of my punishment, every step no matter how halting felt like power, every step no matter how hard felt like progress. Every step I took felt like a step toward liftoff. Today was far from effortless. But today I felt I flew. Wonderful post. I am proud of you. Hey solitary kitsch! Do you have anything posted somewhere about your marathon? Would love to learn from your experience. Morpheous: "You gotta let it all go Neo; fear, doubt, disbelief"
what did Mao Tse Sung say? The journey of a thousand miles starts with a single step. What do most women say? The journey of a thousand miles can be shortened by first asking directions.... or something like that. Good job on the run/ride swim. The only way to ride or run 3 miles is to do one mile, bu first do 100 yards or 100ft. If you can make 3, you can make 6. If you can make 6 you can make 10. If you can do 10, you can run a marathon. It's all about pace and starting with that first step. Just remember, the fun is in the journey--when you cross the finish line in Smithville, you'll feel pride, relief...but more likely...that's it? I can do that...now what. The now what is the fun part. You're not training to do one arm push-ups. I'm not even sure where you'd sign up for a one-arm push-up competition. You're training for something more; something better. I've lifted for years and that's all it was; lifting. Now we're TRAINING for something and it's much more exciting.